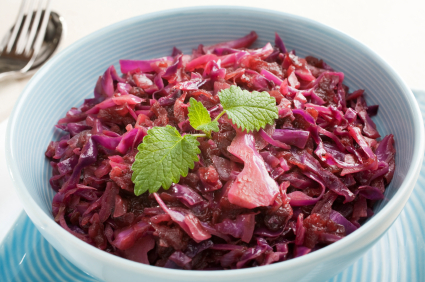 A delicious vegetable dish to eat with any rich meat, or sausage, spiced red cabbage with apple contains onion, nutmeg, allspice, balsamic vinegar and redcurrant jelly. This Polish Red Cabbage Recipe (Czerwona Kapusta) is fantastic. I have been searching for years for a great red cabbage recipe since I visited Oma’s Haus in New Braunfels. I have finally found a restaurant quality recipe and I am so excited! 1. Clean and cut red cabbage into quarters (discard core) and then coarsely shred (or use food processor). 2. Add onion and cabbage in a large pot with butter and/or olive oil. Cook slowly to reduce. 3. Mix rest of ingredients (including the rest of butter) together into bowl, pour into pot. Mix well. 4. Simmer slowly for 30-45 minutes. Check to make sure that the juices have not 100% evaporated–you do not want anything to burn on the bottom. You can add 1-2 tablespoons of apple cider vinegar if needed. Stir occasionally. 6. Best if refrigerated over-night and reheated the next day! This entry was posted in Cooking with your Polish Pottery and tagged Polish recipes on July 20, 2015 by Sara.